Where to next for mobile ads? The future of mobile advertising is bright. Marketers and advertisers now know that there are big dollars to be made through mobile advertising. It’s the future… in fact, in 2016, $101.37 billion is expected to be spent on ads served to mobile phones and tablets worldwide, an increase of nearly 430% increase since 2013 (eMarketer.com). The exciting thing about mobile advertising is that the possibilities are nearly endless. The days of pixelated banner ads are a thing of the past. Marketers now have an almighty weapon at their disposal… the smartphone! The biggest benefit a smartphone device provides for marketers is its ability to target audience in real-time. Not when they sit down at the end of the day to search the web, or at lunch… mobile allows marketers to target their customers at every moment of the day, anytime a customer may check their phone… even in the toilet! Yes, some people spend almost four hours a day on their smartphone devices, but often those engagements are mere glances to read a message or an email. Attention spans are becoming shorter than they’ve ever been. We’re now living in a reality that is as much digital as it is three-dimensional. Brands now have to fight through the white noise to get heard. Although mobile is the best way to do that right now, it has to be done right. Looking at current trends and not just jumping on board is important. Getting an idea of what it is exactly that consumers seem to be looking for is a great way for brands to get a feel for what they need to start doing now; so that later when the trends have seeped into common human behavior you’re in front of the pack. Take out your crystal ball and gaze into it, down the long corridor of the future to see what’s probably in store for digital and mobile advertising. 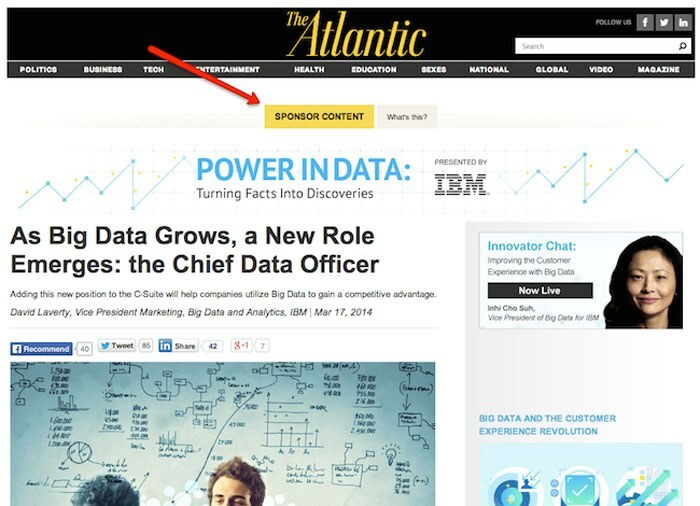 If you’re not familiar with native advertising, it’s this: advertising that matches the form and function of the platform on which it appears. In other words, it’s advertising that doesn’t look like advertising. It fits seamlessly into the context (i.e. website or platform) that it appears. Native advertising works for the simple reason that it doesn’t look like advertising, and more than that because it makes sense where it is. What’s more, it can come in many forms. Let’s take the above example, take from copyblogger.com who investigate the examples of native advertising. Here, you can see an article that appears on The Atlantic; the article isn’t a part of the magazine itself, but it tricks the reader into thinking that it is because it looks like it is, because the layout looks native to that particular magazine, and the title of the article is one you might expect. This sort of advertising and marketing is happening more than ever before, with mobile being the preferred platform of choice. Why? Like I said earlier. Consumers have small attention spans, they can be, let’s say “tricked” into reading content. But It doesn’t however just stop at articles. It could be a video, product placement in posters, magazines, images, etc. Native advertising is a chameleonic shape-shifter. Expect extremely quick progression. Watching videos on most new-ish smartphones isn’t what it used to be. Many phones now have 4k screen resolutions. More important than that, phones are huge. Even regular smartphones (not phablets) sport screens that will barely fit into a tight jean pocket. This is probably why video accounted for 13.3% of display expenditure on the mobile platform last year. It’s also why mobile video investments are expected to double by 2019, not to mention that this is just the beginning. Think Oculus Rift, HTC Vive, Apple VR and all the other virtual reality headsets that are slowly creeping onto the scene. Think built-in projector screens. 4k is only the beginning when it comes to how we’ll be consuming video through the mobile platform in the near future. Video is set to become an immersive experience, destined to integrate directly into the real three-dimensional world around us, almost as an extension of it. Today we’re standing tentatively on the first step of the mobile platform. We’re barely out of our diapers. Expect to see mobile video advertising burst out into numerous directions. Naturally, immersive ads, like immersive videos, will play a major role in shaping the way marketers approach mobile advertising in the future. What the Twitter world of 140-characters or less has taught us about our civil selves is that a) to reiterate, we have short attention spans; and b) to keep our attention, we need to be entertained. Immersive ads are the way forward in this regard. Facebook have already introduced Canvas, a full-screen immersive advertising product for iOS and Android phones. Canvas is currently available to all advertisers, via an easy-to-user, self-service tool in Power Editor, and it creates News Feed ads for users with iOS and Android phones. If you’re wondering what an immersive ads looks like then check out this ad from Coolris (it’s an old 2011 video, but it’s bloody cool). Immersive ads can better engage and entertain users, and this ad from Coolris show your exactly how and why. Imagine how useful immersive ads such as this might be for car manufacturers, or game developers, or even cocktail makers? A shortcut into user absorption; they’re entertaining, they’re fun, and as the technology improves and developers make creating immersive ads on the mobile easier to implement, expect to see them flower—fast. While the future is bright for mobile advertising, there still is a long way to go. Personally, we feel that mobile videos, immersive ads, and native advertising are all having a significant impact on the future of mobile advertising, but there still is well and truly a lot of room for growth. We will certainly be keeping a keen eye on its development, searching for new and exciting innovations we feel are just around the corner. What do you think the future holds for mobile advertising?